We got up at 4 am for the morning cab ride to the airport. It helps if you go to bed early. It also helps if you sit in the front with the cabbie, who at this hour is always a little sleepy. Can’t say that I blame them; these guys work awfully hard to scratch a dollar in this economy. All the same, they do love to drive fast in this country, and 140 clicks down the highway in the backseat of a cab driven by a guy who is nodding off can be a little unsettling. 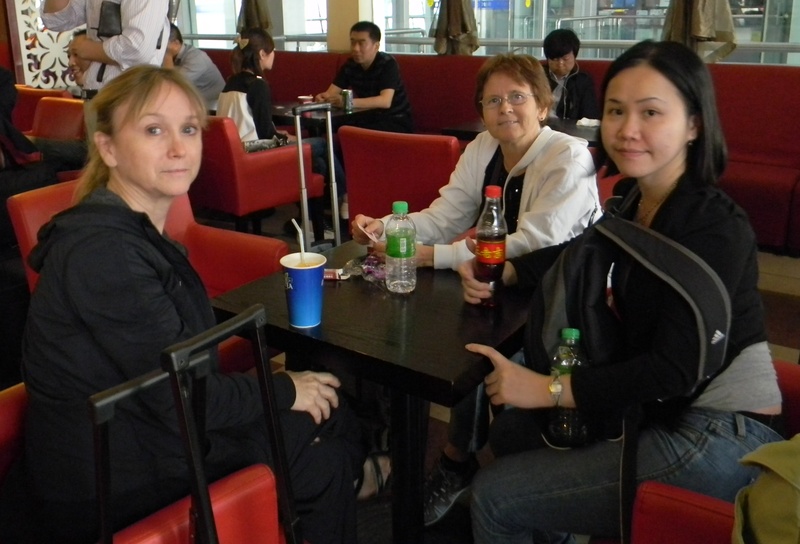 Check in was a breeze, as it always is with Air Asia, and we were settled in the airport’s Coffee Bean with our lattes long before Shelley and Moochi, our companions for this trip arrived. The flight to Tianjin was uneventful. We had this Chinese lummox crammed in beside us who clearly needed a much larger seat than is available in economy class. But he got himself moved to somewhere else and Pam had room to stretch out and sleep for a good part of the journey. Tianjin airport was clean and efficient and we easily found the ticket booth for the train to Beijing. 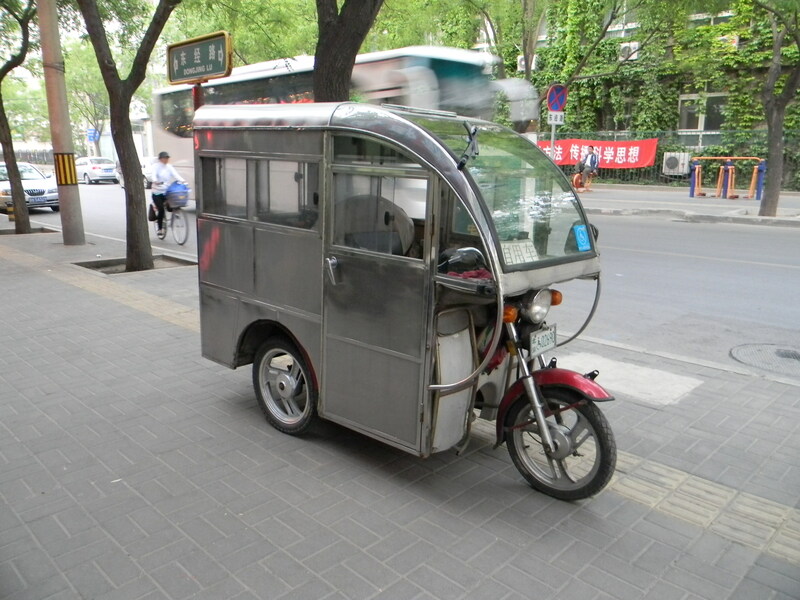 The bus at 40 yuan was cheaper, but the train at 60 yuan ($10) is a better option. There was a connecting bus, which was not pleasant, but not terrible. The train however, was marvelous. We hummed along at nearly 300 kilometers an hour and the ride was a smooth as your grandma’s rocking chair. Outside the rice paddies and vegetable plots eased peaceably by. There seems to be some kind of reforestation program going on, as there were acres of newly planted poplars everywhere along the train tracks. Reforestation sound like a good plan for China as there was not much on the way of natural forest left that we could see. The result is air that looks a lot like grey soup. You will see it in all the pictures that we took, although the photographic lens does lie to excess in that the diffused smog distorts the camera’s light sensors. The reality is better, but not by much. The smog is not localized, like it is over Toronto or New York, but seems to be pretty much regional. It was if anything thicker on the ride to Shanghai. But I am getting ahead of myself. 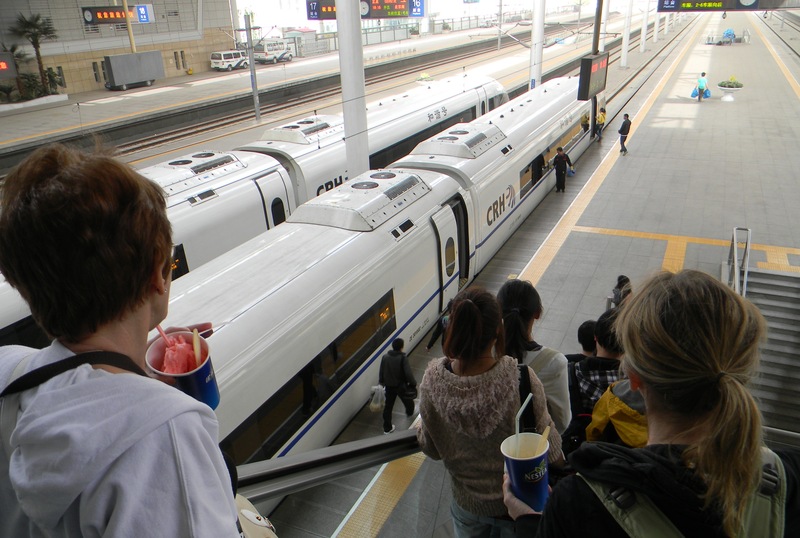 The train station in Beijing was impressive; very modern and efficient, much more like an airport than anything else. The line up for a cab was at least a hundred people long, but it was moving pretty quickly and we opted not to take up the offer a ride in a private car for 200 yuan ($35) as we had deliberately chosen our hotel for its proximity to this particular terminal. The meter on our cab was 20 yuan. I paid the cabbie 30 and we unloaded at the Holiday Inn Express Temple of Heaven. I assure you there was nothing heavenly about our surroundings but only a rather dreary commercial landscape with grey streets and grey buildings joining the grey air in a dismal harmony. I scouted the area for a suitable restaurant while the ladies unpacked, then we went out to a local eatery for a sampling of Beijing fare, which was tasty, but heavily salted and loaded with MSG. After dinner we tried the hotel’s internet only to find that this was going to be severely limited during our time here. We could view our website, but as soon as we tried to enter the site to upload a post, it went offline. Facebook was similarly blocked. Google was fine and we did gain access to our email long enough to email a message to our kids, but that was about as far as we could get. Blocked from access to the outside, we turned our attention to the task at hand: plotting out our trip to the Great Wall. We had obtained a couple of leads from colleagues back in KL, so I gave them a call. With the May 1 holiday around the corner, people were reluctant to brave the traffic for the drive to the Great Wall, our destination for Day 2. But we did find one guy who was willing to drive and who knew the way to Mutianyu, our preferred section of the wall. The catch was that he didn’t know English, but here is where Moochi came to our rescue. She is fluent in Mandarin and Cantonese and handled all of our translations for the week. We booked the driver for 7:30 and called it quits for the evening. We were going to need our strength for the following day.